known for its exquisite natural beauty, influential history, plantations crops and the rich flora and fauna that are concentrated in the vast stretches of the lush green forests. Wayanad is famous tourist destination in Kerala and the scenic hill station offers so many exciting things to do and see. From plantation tour to wildlife trekking, Wayanad offer tour too many exciting places, which makes it quite a famous tour destination listed in almost all the itinerary of Kerala vacations and holidays. Some of the top notch places to visit in Wayanad are highlighted as below. 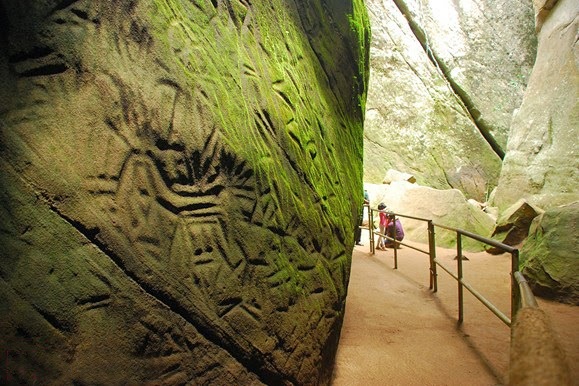 Among the many interesting places to visit while in Wayanad is Edakkal Caves. Located some 25 kms from Kalpetta in the Wayanad district in the remote location, Edakkal caves are two natural caves, that unfolds ancient history indicating the civilization that exist in the region since prehistoric date to at least 6000 BC. The caves have carvings, pictorial writings, a sign indication a man with a jar cup, etc the evidence that highlights that the cave was inhabited at different times of the history. It is a picturesque spot located at the height of 2100 mtrs above the sea level. The peak is a trekker’s paradise and an ideal destination to enjoy the panoramic view of Wayanad, a hill station which is enveloped by the gracious charm of the nature. It is a beautiful place to enjoy night camping with camp fire and sleeping bag, in the shivering cold weather. For all these activities, prior permission has to be taken by Forest Range Officer at Meppadi. 2 kms from trek from Wayanad leads to the most impressive and captivating waterfall of the region, Meenmutty Falls. The cascading waterfalls which falls in 3 separate tiers at the breathtaking height of 300 metres is sure to melt anyone heart with its appealing view and charm. During the monsoon season, the falls can only be enjoyed from a distance as the water rises making it bit scary and breathtaking. Located at a distance of 15 kms from Kalpetta in Wayanad, Pookot or Pookode is a natural fresh water lake snuggled beautifully amidst the evergreen forests and the mountain slopes at an altitude of 2100 metres. It is a beautiful place to enjoy the serene beauty of nature and even go for picnicking. The Lake also provides boating facilities again the backdrop of the captivating natural beauty. It is a picturesque waterfall also known by the name Sentinel Rock Waterfalls. Located near Meppadi in Wayanad district, the cascading waterfalls with the backdrop of emerald forest is a treat for the onlookers. Below the pool of the waterfall, the pristine water is an ideal place to enjoy swimming, bathing and water rating. Set in the mist clad hills in Wayanad district some 3200 feet above sea level, Banasura is a must visit destination for tourists who are on a tour to visit Wayanad. The spot is quite famous for its Earthern Dam in India and the second largest in Asia lock away the water of Karamonathodu to satisfy the demand of water for irrigation and drinking during the seasonal dry seasons. The backwater drop of the dam, Bansura hill is a picturesque spot for tourists who want to enjoy beautiful time in the cozy lap of nature with an enriching experience. Beside these, there are many other beautiful places to visit in Wayanad. Plan your vacation to this hill station and explore the places and attractions which are blessed by nature and the serenity that adds pleasure and joy to your holidays.